Getting kids excited about learning by making it more like watching or taking part in their favorite sport can make students forget they are learning. They see it as having fun. In a time when educating children has become ever more challenging, one organization has brought the fun in learning outside of the classroom. Science of Sport is a non-profit foundation dedicated to developing curriculum and programming that promotes science, technology, engineering and mathematics by bringing those subjects to life for students and teachers through hands-on learning. 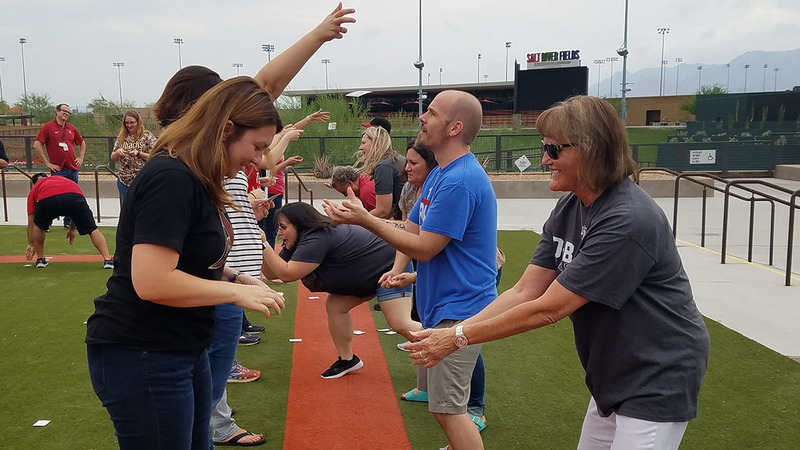 Teachers are given an educational “play kit” composed of a set of bats, wiffle balls and bases to enable students to play organized baseball. However, this kit also includes a tape measure, dice, trading cards, protractors. One of the more popular items in the kit is a water balloon launcher designed to measure distance and velocity. “That’s probably our most used tools because of how many students can be involved with that lesson,” said Ricardo Valerdi, the creator of Science of Sport. Valerdi, an engineering professor at the University of Arizona, established the program in 2013 as a way for Phoenix-area instructors to educate their students by actively engaging them rather than lecturing. The program has grown exponentially, sponsored by more than a dozen professional sports teams, teaching over 1,000 instructors and educators and reaching more than 100,000 students nationwide. “Never in my wildest dreams did I think this program would grow to where it’s at now,” said Valerdi. Teachers who have gone through the program said teaching their students through this method gives them more motivation to learn. Gina Harrop, a sixth grade math/science/social studies teacher at Augusta Ranch Elementary in Gilbert, Arizona, has gone through the program twice and has seen how impactful it is, not only for her students. Harrop said she enjoys the fact the activity that surrounds the curriculum makes her students forget about the lesson and focus on playing. “Playing sports just motivates them to play and when you do that, you take the learning out and see them having fun,” she said. Students learn both math and science through concepts mostly derived from sports. It is through the application of these activities that students learn about the sport they are playing. The importance of Science of Sport, and other programs similar to it, is the engagement it has with kids. It is a point that Valerdi and his team emphasize to all the teachers and instructors who participate in this program.